The Komplete Audio 1 & 2 are audio interfaces; ideal for musicians, beat makers and performers! The Komplete Audio 1 features a single XLR and single jack input, with individual gain controls. It also has a stereo RCA output. The Komplete Audio 2 expands to stereo recording thanks to the inclusion of 2 combi XLR/Jack inputs. It also features stereo jack outputs. Both models operate via USB 2.0 or higher and can record high-quality audio at 192 kHz and 24 bit. 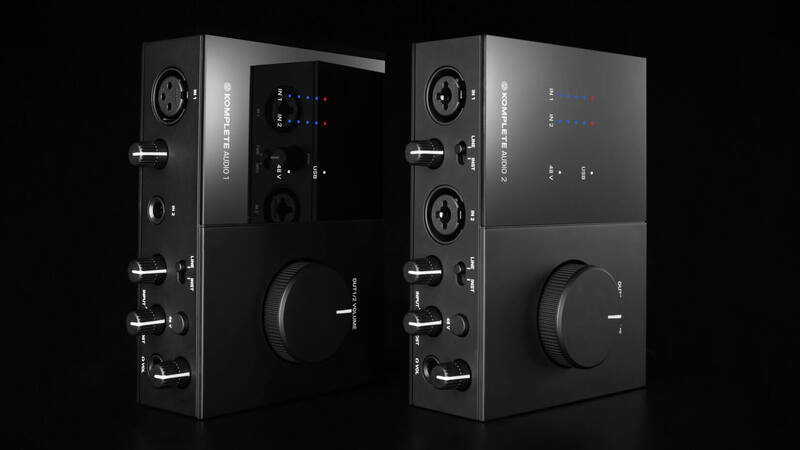 They both feature a VU meter, big volume knob and direct-monitoring functionality. MASCHINE ESSENTIALS – Full Maschine software as included with Mikro, Maschine Mk3 and Jam, as well as 1.6GB of samples, one shots, loops and instruments. The Komplete Kontrol M32 is super portable, has a sleek design, and gives you the ability to tap into a wide range of instruments. It’s also Native Instrument’s first micro-sized keyboard. This is the most affordable way of accessing the legendary Native Instruments software packages.